Have you ever dreamed of taking a stroll around a cartoon-like castle? Getting inside a fairytale is easier than you thought. Located at the foot of the Ai-Petri peak, the Vorontsovsky Palace is an exciting blend of traditional European, English-style architecture and Mauritanian and even Arabic motifs. From its construction in 1848 to the revolution of 1917 the palace served as a residence for three generations of the noble Vorontsov family. Its interior is exuberantly decorated. Winston Churchill stayed here during the Yalta Conference in 1945. The best time of year for a visit is May and June when the Italian Renaissance Park is flush with the lushness of blooming rhododendrons. Grand Duke Peter Nikolaevich, the uncle of Nicholas II (last Russian emperor), was so greatly impressed by the architecture of the Middle East and the Maghreb that he ordered a palace be built based on the drawings he had made during his journeys through those regions. Today, Dulber is one of Yalta's premium-class health spas. This Eastern fairytale Fata Morgana is easily accessible to tourists: You can take a bus from the Yalta Embankment to the sanatorium and then arrange a guided tour of the grounds. Resembling the set of a Cinderella movie, the Massandra Palace is an entire palette of epochs and styles: architects of various times and backgrounds have been involved in the palace construction, although all of them ultimately failed to realize their projects. 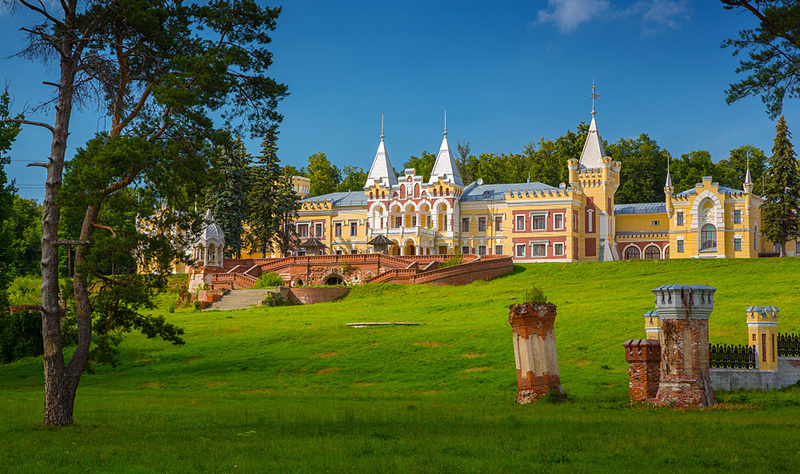 State dignitaries have tried to make use of the castle in a number of ways: Tsar Alexander III wanted to use it as a hunting lodge, while Soviet leader Joseph Stalin turned the architectural landmark into a state dacha. The palace is located some five kilometers away from Yalta at the Verkhnyaya (Upper) Massandra bus stop. You can take a shuttle minibus or a trolleybus to get here. An ordinary secondary school in Yoshkar-Ola has turned into a fairytale castle due to the efforts of local businessman Sergei Mamayev. Mamayev wanted to make his wife's dream come true: as a teacher, she dreamed of working in a school that children would enjoy going to. From 1998 to 2001, a construction team erected a castle for little princes and princesses, with a swimming pool, a well-equipped gym and even an in-house dressage center — all in the finest traditions of knighthood. This castle, located 50 kilometers from Ryazan, is a creation of Russian architect Fyodor Schechtel. This fairytale mansion made the young architect famous, while also bankrupting its owner, the Russian Count von Derviz, in the 1910s. Today, the Kiritsy Castle houses a sanatorium for children suffering from tuberculosis of the bone. Unfortunately, the castle is no longer open to the public, so be prepared to admire the fairytale towers from a distance. The shores of the Kuybyshev Reservoir in the town of Khryashchevka, Samara Region, is headlined by the "Garibaldi Castle" – a tourist complex currently under construction. A night in the royal chambers will be available to tourists as early as 2018. However, you can come in for a medieval photo session now while the designers are putting the finishing touches on the palace's interiors. If you like sports then harness the wind with the help of the local windsurfing school Sila Vetra (Wind Power). The Pyany Mys (Drunken Cape) surf station can provide you with all the necessary equipment. This castle in the Yauza River valley was not built with fairytales in mind. In the 1930s the facility was used as a light-bulb factory, although today it hosts loft-style offices, coffee shops, photo studios and small-batch manufacturers. The industrial halls of this neo-Gothic castle are so spacious that you can ride a bike in them. Albeit simplified and deprived of high towers and fancy rose windows that were included in the original design by architect Georgy Yevlanov, its layout still holds up when compared to Moscow's other neo-Gothic landmarks.